Here, you'll find all downloads from A. S. I. Records' artists and associates. All items can be downloaded by clicking on the "Download Link" or by clicking on the accompanying artwork. To assist you, there are Featured Songs from each project located to the right of the project. Produced by Audiosociety's own DJ Jaysin and featuring Ascidzz, Avenu, and Re-Syted, Middle Of The Night is a project primarily inspired by the energy found during twilight hours. 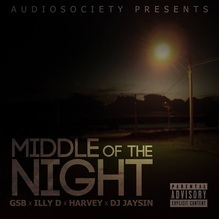 Starting as a small EP with DJ Jaysin and GSB, MOTN has grown into a full fledged LP with the entire Audiosociety crew. Featuring Daily Dose artists Avenu and Re-Syted, as well as budding artists Poltergeist and Ascidzz, MOTN brings more than expected in a package that remains authentically Audiosociety. It has been said that it is best to listen to this during the night hours to really experience what this collection intends. Most of the songs were written and recorded in the middle of the night, thus, enjoying the music at a similar time might induce a metaphysical experience...or so we've heard. In the end, Middle Of The Night is another solid project from a growing, stronger, Audiosociety. 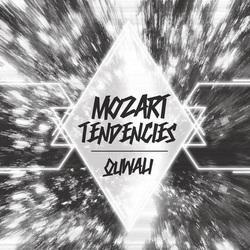 Download "Quwali - Mozart Tendencies"
Featured Artists: Quwali, KL, Hunter, Dan K.
Download "JustQ - Yall N- Want Some Pie??" The long-awaited mixtape from co-founder and renowned artist of Universal Battle Realm. Hosted by GSB (of Audiosociety), Frontline exposes many things. From societal woes to the seeming blatant dilution of the Hip-Hop game, Frontline, the first mixtape from the artist known as "Avenu" encompasses the angst of modern America all in a nice, compact, combustible package. Artists and listeners alike should find "Frontline" as the first wave of a new era in hip-hop: Purpose, Positivity, and Precision. Enjoy! Download "Re-Syted - Life Love Lust EP"
Download "JustQ - Just Getting Started"
Download "Skata Jay - Smoke Break"
-With the start of a new year, and expanded group membership (in TaylorMade, Lil Lerch, and Quwali) as well as Production acquisitions (in DJ Jay-Sin, Oneder Beats, and Just Q Beats), Audiosociety has prepared one of their most dynamic mixtapes to date. With discussions of Government corruption and the day-to-day aspirations of people on into love and the struggles of being independent yet focused, Audiosociety has provided an amazing culmination of skill, production, and mastery of craft in this release. If DOI is any indication, 2013 might be looked back on as a turning point for this crew. A. S. I. Records Inc.
-As a member of the rap group Daily Dose, Re-Syted has often dealt in a contemplative style of rhyming that stands on its own. This past year, Re-Syted decided to use his artistry in a way to address societal issues and the struggles of the modern family, all during the time when most of his listeners are likely asleep. A powerful collage... With a striking collaboration with Oneder Beats, Re-Syted has presented and unsurprisingly thoughtful project. Download "Public Service Announcement (Vol. 1)"
-PSA (v1) is seen as the first release of Audiosociety given the full-length attribute of this mixtape. Released as a proper declaration of A. S. I. Records' intent, Public Service Announcement (Vol. 1) attracted local notoriety and respect for what was clear the mission of Audiosociety had become: Uplift! -This is the first release of Audiosociety. Completed in an effort to provide musical awareness of the Japan Tsunami, Audiosociety provided this five-track Courtesy CD to assist in the awareness of the tragedy, while also donating to local efforts to assist the victims through local charity, most notably, the "Jam For Japan" event in Albuquerque New Mexico.